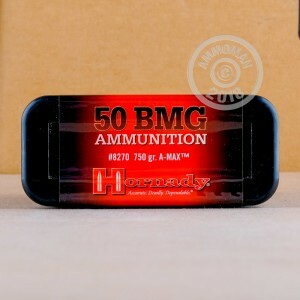 This 50 BMG ammo by Hornady is perfect for your high-caliber rifle while on the range or in competition. Hornady's A-Max Match bullet sports a secant ogive shape that produces high BC because of its aerodynamic contour. Hornady's Heath Shield Tip helps keep the bullet's structure consistent during flight while under immense heat caused by high velocities. These rounds have a quick muzzle velocity of 2820 fps. The tremendously heavy 750 grain projectile is boat-tailed for better accuracy, making you virtually unstoppable on the range. Hornady manufactures their ammunition with premium components, and each round is crafted in accordance with their strict quality control standards in their Nebraska-based factory. 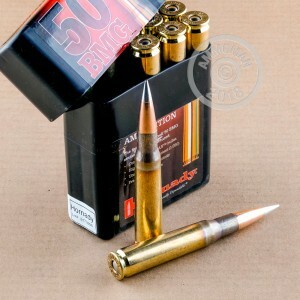 Each 50 BMG cartridge in this pack of 10 comes in a new Boxer-primed brass casing that is reloadable.